Last year I spent Christmas at St Andrew's Cathedral. There was incense, holy communion and a whole heap of other stuff that would horrify many Sydney Anglicans and the Moore College crowd. Which is their bad luck because this St Andrew's Cathedral was in Tokyo! 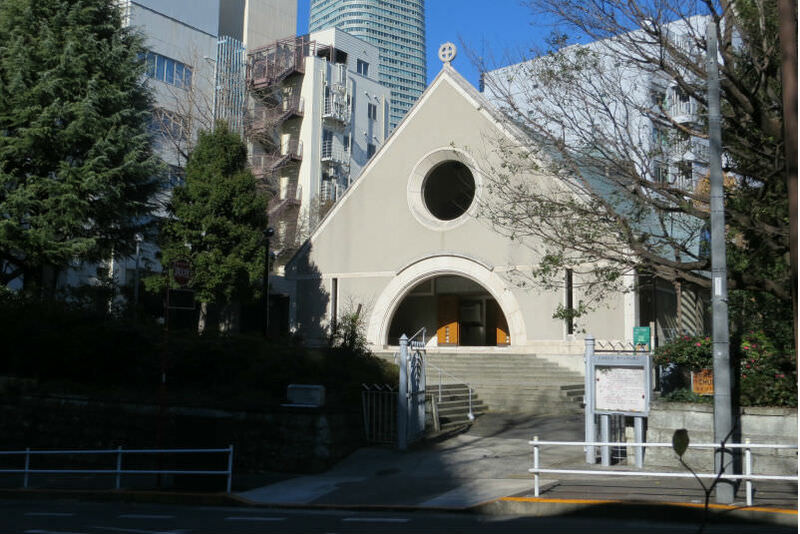 St Andrew's is the Cathedral Church of the Tokyo Diocese of the Nippon Sei Ko Kai. I doubt Henry VIII imagined a diocese with a name like that! Still, I doubt he imagined his Church of England being established in Japan, its bishop named Andrew Yoshimichi Ohata and its dean (a woman!) named Maria Grace Tazu Sasamori. And neither he nor I would have expected English speakers being relegated to a small hall next door to the main Cathedral. Why? Because the main Cathedral service was reserved for Japanese-speakers, thank you very much! In the main Cathedral, hymns were sung in Japanese and prayers addressed to Iesu Kirisuto. Who could imagine English speaking worshippers relegated to a place outside the main centre of the Church of England? To compensate, the hall was provided with its own name — St Alban's Episcopalian Church. Yes, we have to keep those Americans happy. The church was named in honour of a holy martyr, and I couldn't help but notice what looked like Byzantine relics. The reverend conducting the service (from memory, Father William) was more contemporary. American lawyers don't just stand behind the bar table but roam around the court room. This reverend walked among the congregation prosecuting his Christian case and making the Christmas story real. He spoke of the politics of that day, the clash between Herod and the Romans and priests, the social and political dangers affecting different Jewish groups. The little baby in the manger descended from King David didn't just appear in Bethlehem in a vacuum. The reverend compared the precariousness of the baby Jesus' family to the precariousness of other communities today. He spoke of the Iraqi Christians on the Ninevah Plains. But that wasn't all. No one objected when Father William asked us to pray for the people of Bethlehem who, in his words, 'continued to live in brutal occupation behind a huge concrete wall'. Rarely have I seen Palestinians get such a prominent mention in a Western church. Middle Eastern Christians, indeed any Christian minority, only seem to matter when their persecutors are Muslim. And yes, such minorities should and must matter, just as Muslims shouldn't ignore persecuted Muslims in the Central African Republic or Xinjiang. Selective concern for one's 'own' compromises our claims to being a community of believers, whether as Church or Umma. "Christmas is about understanding that those closest to God are those who are most vulnerable. It's a Christian and Islamic lesson I had to go all the way to Tokyo to learn." What made Father William's comments about the Palestinians even more surprising is that so many Christians in his own country turn a blind eye to the plight of their coreligionists in the West Bank, not to mention of Palestinian Christians in Israel proper. Some even imagine that Palestinian Christians are more at risk from their fellow Palestinians of Druze or Muslim persuasion. They ignore that some of the most respected Palestinian spokespersons (such as the late Edward Said and Hanan Ashrawi) were and are in fact Christian. So often do we imagine those who identify themselves as belonging to our faith will share our prejudices. Recently in Australia, a group of Christian politicians suggested that the refugee applications of Syrian and Iraqi Christians should be given preference over those of Syrian and Iraqi Muslims. This made me wonder how they could tell the difference between the two. And how could a violent Islamophobe tell that the Syrian bloke named Fouad Abdallah actually attends the Suriyani Orthodox Church every Sunday? Father William's message to his Midnight Mass congregation was that God sent his Messiah to share the vulnerable and persecuted state of all who suffer. God's Messiah was born in a small village called Bayt Lahm, his mother and her fiancé refugees fleeing from a tyrant puppet king installed by a superpower. His mother was also fleeing the nasty judgments of those who assumed she must have given birth out of wedlock. The Qur'an mentions a miracle not mentioned in the New Testament, of the baby Jesus speaking from the cradle defending his mother's chastity. It mentions the angel approaching Mariam (Mary) to inform her that God had chosen her above the women of the ages to bear his Messiah. Christmas is about Jesus and Mary. How can it be otherwise given the sacrifices she had made to keep the baby safe? Christmas is also about understanding that those closest to God are those who are most vulnerable. It's a Christian and Islamic lesson I had to go all the way to Tokyo to learn. Not only a lawyer and blogger, but also a Muslim who has attended a Christmas service in an Anglican church in Tokyo. There's no doubting your versatility, Irfan. A bit like myself, if I may say so. As I won't be celebrating Christmas in my town this year I'll have to find a place with bells and smells and I'll be honoured. Merry Christmas. Anglicans would know full well the plight of Palestinian Christians as there is a fully independent Episcopal Diocese in Jerusalem in communion with Canterbury under Bishop Soheil Dawani, himself a Palestinian. The diocese covers Jordan, Palestine, Israel, Syria and Lebanon. Most members of the diocese are Arabs, mainly converts from the ancient Orthodox Church of Antioch or their descendants. Edward Said was and Hanan Ashrawi is an Anglican. Palestinian Christians have never moved away from their land altogether. There certainly seems to have been strong pressure from the Israeli government for them to do so. Father William sounds like an American and the Episcopal Church in the USA has strongly supported its Palestinian siblings, both in spirit and materially. Sydney is an atypical Anglican archdiocese but does have some very High Anglican churches, such as Christ Church, St Laurence, which is a world famous Anglo-Catholic 'shrine'. Anglicanism has a very complicated history. Henry VIII merely broke with Rome. It was his children, particularly Elizabeth I who developed what T S Eliot called the 'sensibility' of Anglicanism. Far more Nigerians attend Anglican services than Anglo-Saxons do. Times have changed. A beautiful article linking our beliefs with our actions today. Thank you very much for this i. We do live in a global village and it is a pity that we do not have access to writing like yours very often that tell the stories. Your experience, sensitivity and humour shine through every sentence.